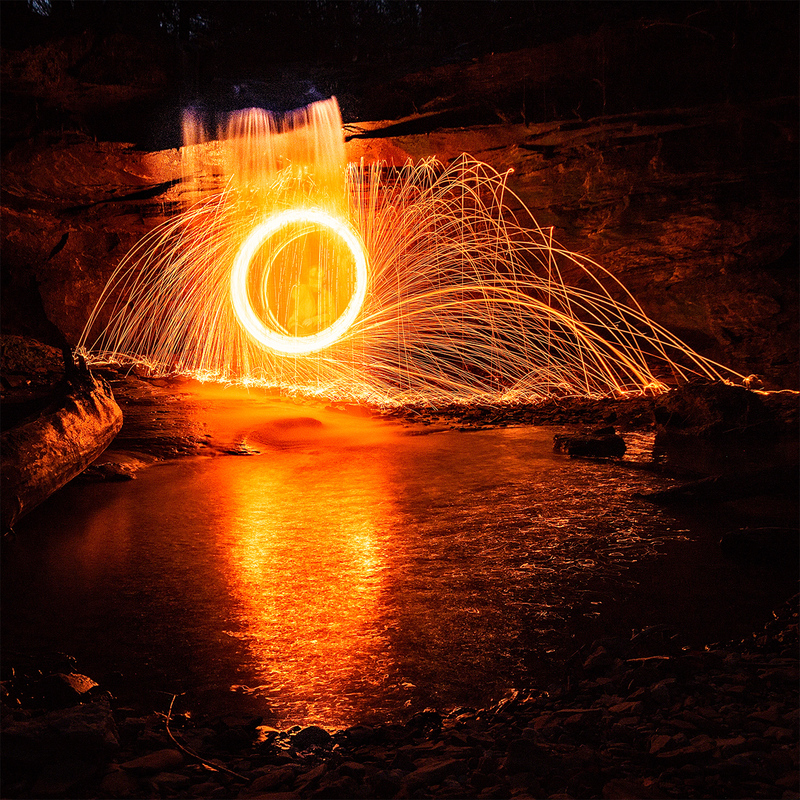 After spending a good long day in Hocking Hills (see my previous post), I met up with some Instragram friends, @kellyephotography, @myohioadeventure, and @justnsmith11, to try combing steel wool spinning, light painting, and waterfalls. 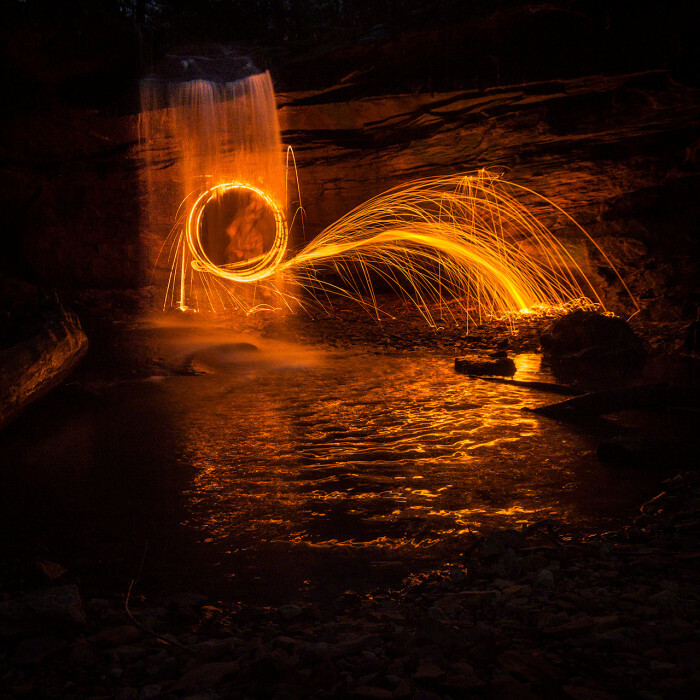 This was the first time I’d tried steel wool photography and the first time I’d tried collaborative photography. 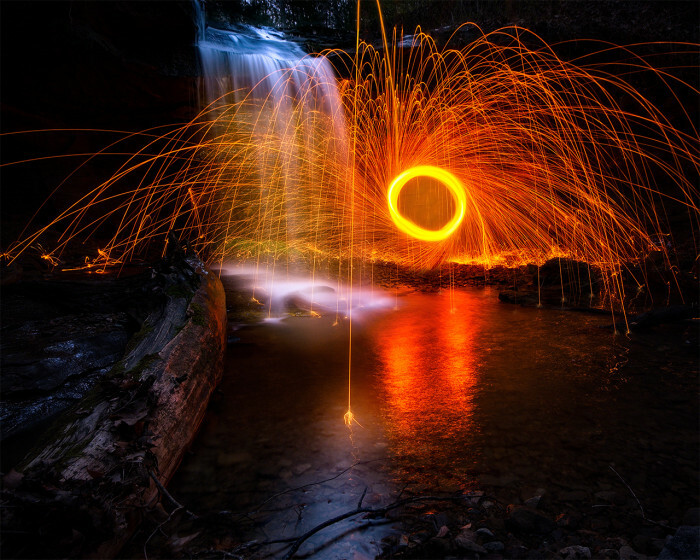 To combine steel wool spinning and light painting, one person spins the burning wool while others light paint with a flashlight and take the long exposure shots. It would be possible to do this by yourself by setting up your camera to take long exposures one after another then getting into position and spinning, but it’s much easier and more fun with other people. Before it got dark I took a long exposure test shot of the falls while Kelly was moving around at the top. It turned out looking like a photo of the ghost of Liberty Hill. All photos are copyrighted and protected by Digimarc. After dark, Kelly did the first few spins. At the top of the 10′ waterfall was a dry spot where she could safely stand and spin. 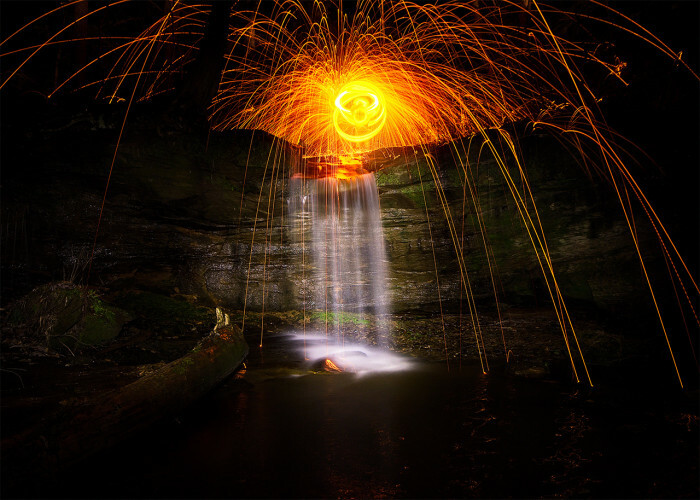 During each 10 to 13 second long exposure I light painted the falls and the rocks with a Feit 72336 – 1000 lumen flashlight . Combining three of the spinning shots in Photoshop produced an even more dramatic photo and obscured Kelly. It also unintentionally produced a slightly demented looking smiley face in the center. Kelly moved down next to the falls so we could try a shot of the sparks and water side by side. In one shot, a spark happen to land right in front of my camera which hopefully helps a viewer feel more connected to the scene. On my first try at preparing and spinning the steel wool myself, things didn’t go as expected. I didn’t stuff the wool into the metal whisk correctly and as soon as I started spinning, it flew out. D’oh! “Oops” and “fire” aren’t generally a good combination. I did get a successful spin behind the falls. 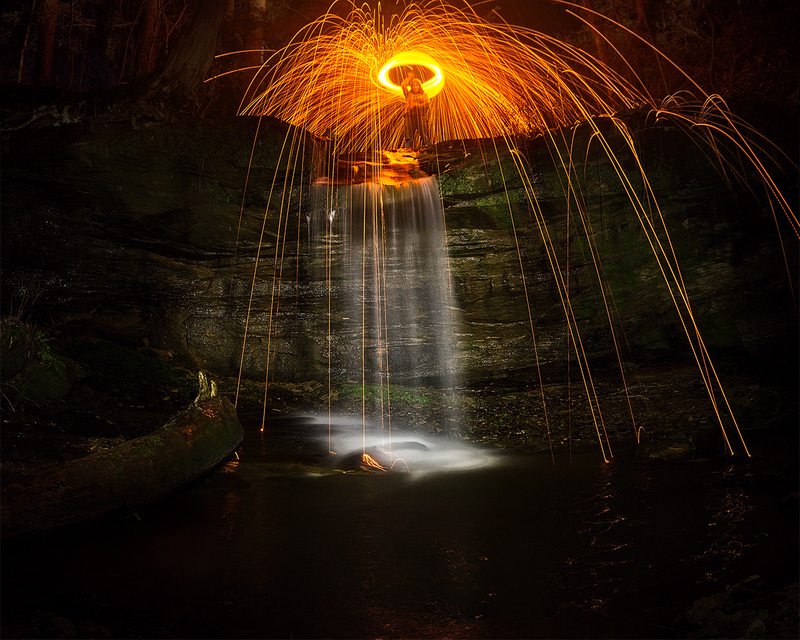 Having the sparks bounce off the rock overhang, but to me the steel wool overwhelms the water. I had a great time and loved trying and learning new things. Next time I want to try mixing a light orb and a waterfall.